And then, looking toward the bed, he saw that dirty lady, and held his breath with astonishment. 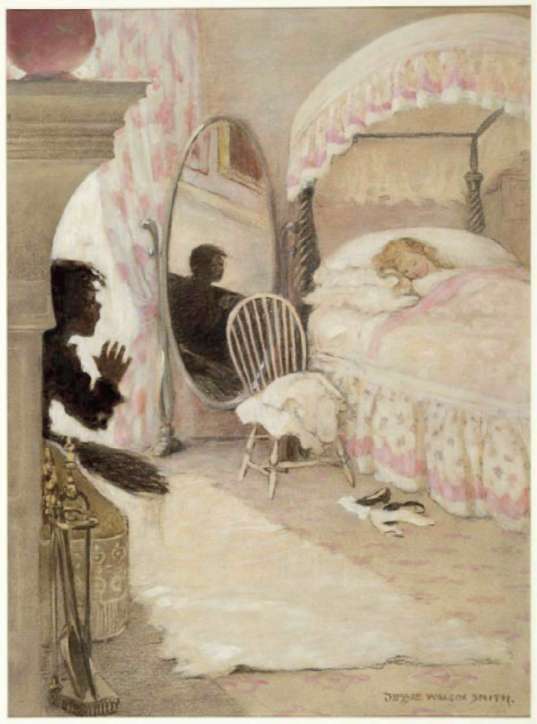 Under the snow-white coverlet, upon the snow-white pillow, lay the most beautiful little girl that Tom had ever seen. Her cheeks were almost as white as the pillow, and her hair was like threads of gold spread all about over the bed. She might have been as old as Tom, or maybe a year or two older; but Tom did not think of that. He thought only of her delicate skin and golden hair, and wondered whether she was a real live person, or one of the wax dolls he had seen in the shops. But when he saw her breathe, he made up his mind that she was alive, and stood staring at her, as if she had been an angel out of heaven. And looking round, he suddenly saw, standing close to him, a little ugly, black, ragged figure, with bleared eyes and grinning white teeth. He turned on it angrily. What did such a little black ape want in that sweet young lady’s room? And behold, it was himself, reflected in a great mirror, the like of which Tom had never seen before.